← BETWEEN PROTESTS AND FOREIGN INVESTMENT: ETHIOPIA WILL BE THE NEW STARTING POINT OF THE MIGRANTS? “This government is at least better than previous ones,” remarked a 74-year-old Eritrean man to me last month in the Ethiopian capital of Addis Ababa, his longtime residence. As it turned out, his assessment of the relative superiority of the current Ethiopian administration was for good reason: two of his children had been killed by a previous ruling outfit, the Derg military junta that took power in 1974 and began eliminating suspected opponents in droves. Although that particularly bloody epoch came to an end in 1991, many a resident of Ethiopia might nowadays still have cause to complain about homicidal activity by the state. 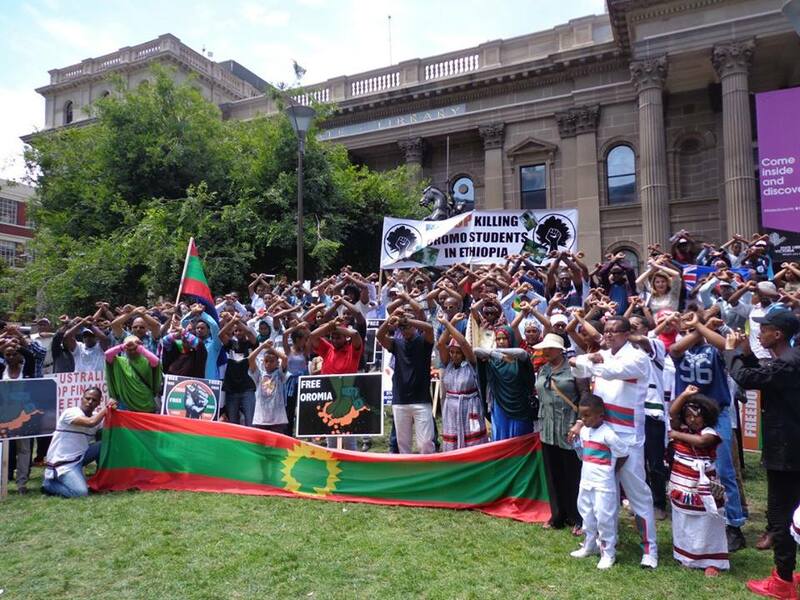 Members of the Oromo community in Melbourne protest against the Ethiopian regime, January 3. Photos: Ali Bakhtiarvandi. In the Oromia region surrounding Addis Ababa, for example, there are claims that more than 200 people have been killed by Ethiopian security forces since November 2015, when protests broke out in response to the government’s so-called “Master Plan” to expand the boundaries of the capital by a factor of 20. This was no doubt a valid concern given the government’s established tradition of wantonly displacing Ethiopians in the interest of “development” — that handy euphemism for removing human obstacles to the whims of international and domestic investment capital. Apparently, torture has also been a difficult habit for security forces to break. Comprising some 35% of the population, the Oromo are Ethiopia’s largest ethnic group and have regularly decried discrimination by the ruling coalition party, the Ethiopian People’s Revolutionary Democratic Front (EPRDF), which is dominated by ethnic Tigrayan interests. Politically motivated detention, incarceration, and other abuses have long characterised the landscape in Oromia, and the current protests have seen children as young as eight arrested. And while the government has opted to shelve the Master Plan for now, protests in Oromia have continued. When I recently visited the town of Woliso, one of many protest sites in the region, residents pointed out that cancelling the plan wouldn’t bring back the dead people. Events in Oromia have been described as the worst civil unrest in a decade. Even without the Master Plan, meanwhile, the government is doing a decent job of courting investors. As I travelled west from Addis Ababa toward Woliso – a journey of about two hours — I passed sprawling factory complexes, including one featuring a Turkish flag flying alongside its more indigenous counterparts. Launched in 2010 with a price tag of US$140 million, the Turkish-owned Ayka Addis factory is said to occupy several hundred thousand square meters of land. Indeed, the EPRDF can point to double-digit economic growth over recent years to justify plowing ahead with its development model. But there’s more to life than GDP – as sizable poverty-stricken sectors of the Ethiopian population can presumably confirm. About 200,000 people were reportedly in danger of trachoma-induced blindness in Oromia alone. In the end, a lot of people in Oromia and beyond might have greater priorities than, say, income tax immunity for international developers. Posted on April 11, 2016, in Uncategorized. Bookmark the permalink. Leave a comment.